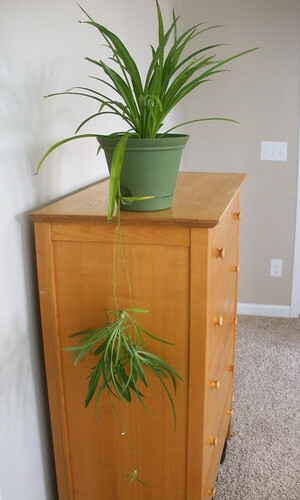 When I was in college, my roommate had a spider plant. She transferred elsewhere and left me most of her plants. When I moved in with my fiance, I had to leave my plants at my parents’ house because I couldn’t take them on the plane. This spider plant is a baby from that plant, that my mom brought me when they came to visit in May 2013. There are two new babies growing from the lowest part of the stem.